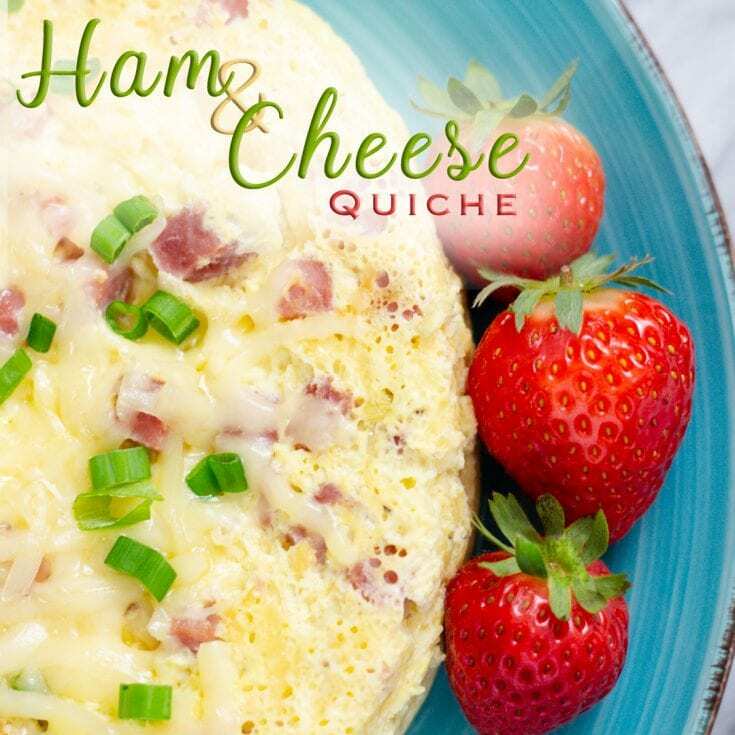 Ham and Cheese Quiche is a crustless quiche recipe made easy in the Instant Pot. 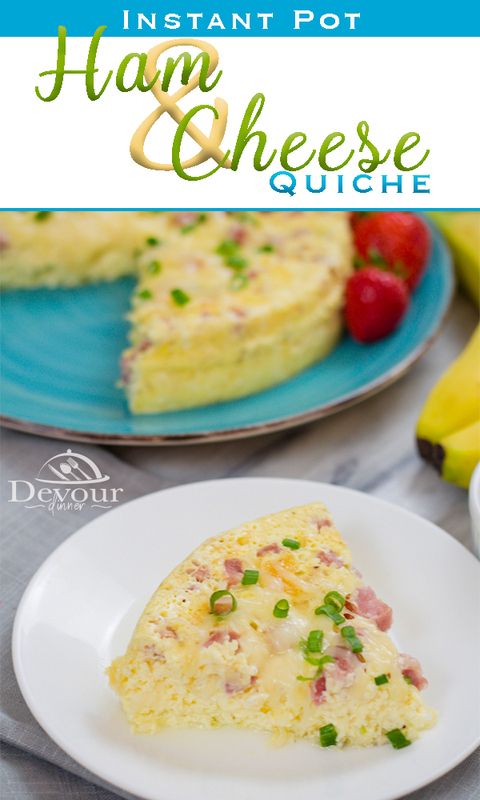 We love this easy quiche recipe on weekend mornings because it’s so simple and quick to throw together and it’s just so good! Egg Bake Casserole is a Crustless Quiche Recipe made easily in the Instant Pot. 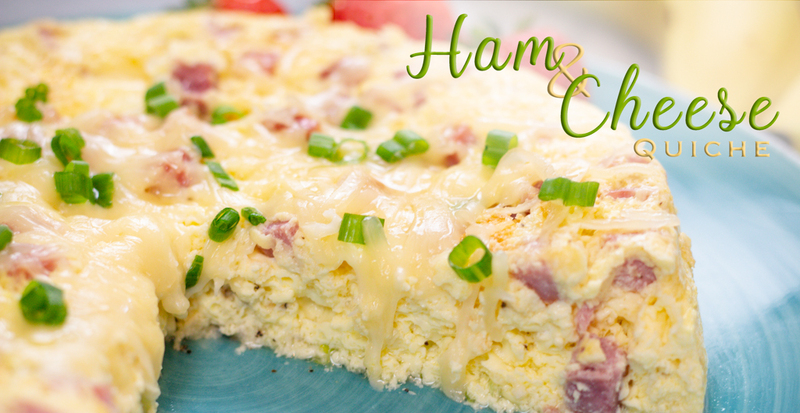 Breakfast Quiche with Ham and Cheese is really good and packed full of flavors. It’s an easy recipe to whip up on a weekend morning breakfast and enjoy. If you are a quiche lover, make sure to try this Instant Pot recipe. Let’s get specific for a moment. What is Quiche? Quiche is an egg bake recipe typically in a pie crust. There are a variety of add-ins from sweet to savory but regardless, it’s just delicious. 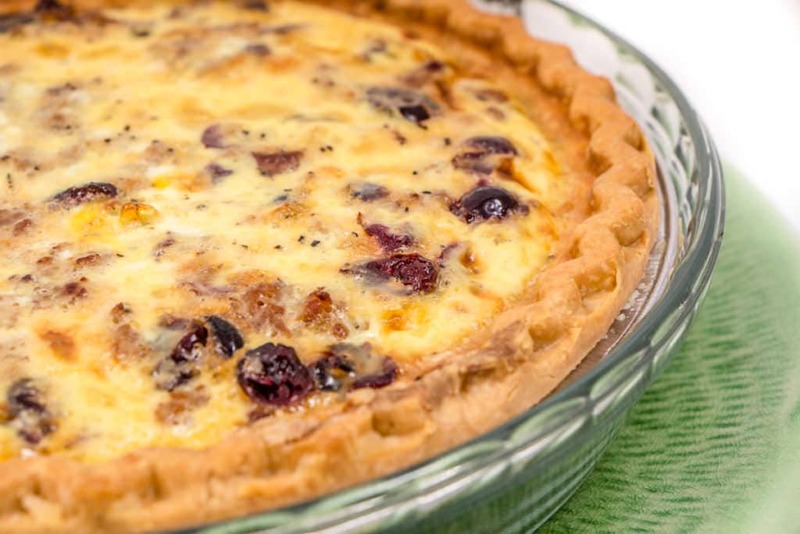 Ham and Cheese Quiche is a traditional favorite for sure, but if you like a little sweet with a little salty, then make sure to check out this Christmas Quiche with cranberries and sausage. It’s among my favorites all year long. Quiche is one of those recipes that seems like it might be difficult when really it’s very simple. For this recipe you whisk eggs and throw in the remaining ingredients. Then just bake away in the Instant Pot. You can also bake this in an oven as well and it turns out pretty much the same. Delicious! There are so many factors that go into making quiche. One reason why people think making quiche is difficult. It’s important to bake quiche low and slow. Baking quiche slowly creates a beautiful texture and doesn’t scramble the eggs. Cheese is also very important in a quiche. A Soft cheese will create a nice texture when melted that runs throughout your quiche recipe. Why is my Quiche Watery? Watery Quiche happens for a number of reasons. When a temperature is too hot for too long the milk and cheese can separate producing a clear watery substance. It’s easily blotted off with a paper towel if it’s a problem. What to serve with a Crustless Quiche Recipe? We choose to serve crustless quiche with some fresh fruit. Many choose to eat a crustless quiche for a low carb option so choosing some healthy fruits will add to this protein breakfast. Is Crustless Quiche Recipe Gluten Free? Yes, it can be. Many Quiche recipes call for natural ingredients. 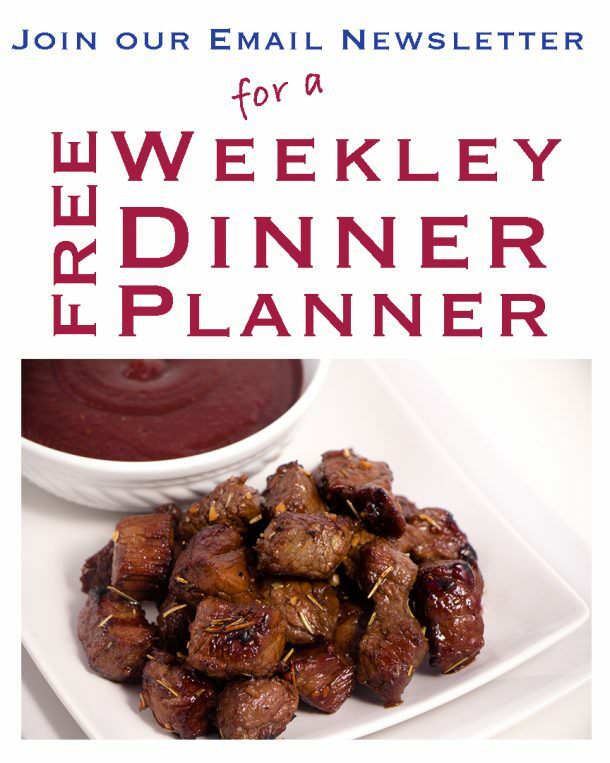 Make sure you are using products that are gluten free and this recipe will easily be a favorite for your allergy needs. Crustless Quiche is the same as an Egg Bake Casserole. It’s an egg mixture with meat and or vegetables and other ad-ins including milk and cheese and baked without a traditional pie crust. Use a casserole dish when baking in your instant pot and you can serve your crustless quiche from the dish. OR use a 2 tier stackable pan and only use on pan and flip the quiche out like shown in the recipe. Either way works great for this Crustless Quiche. 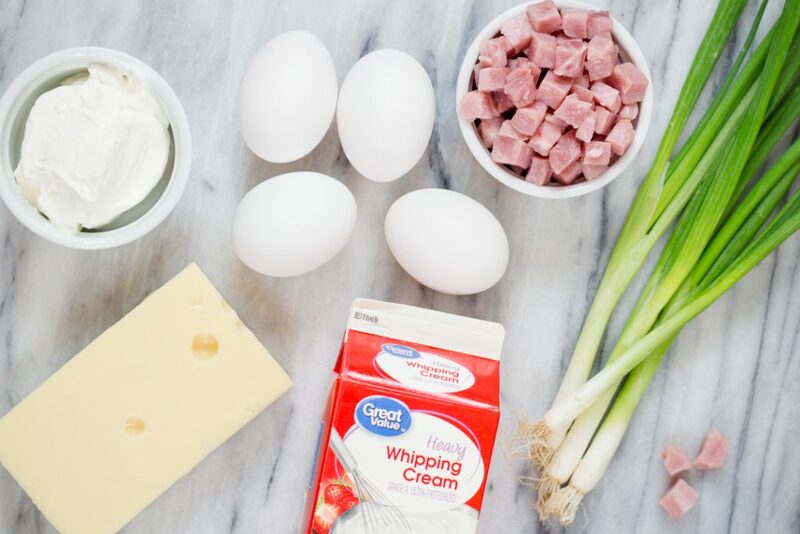 Add Ham, Sour Cream, Green Onions, and Cheese and stir to combine. Add milk and heavy cream and stir to combine. 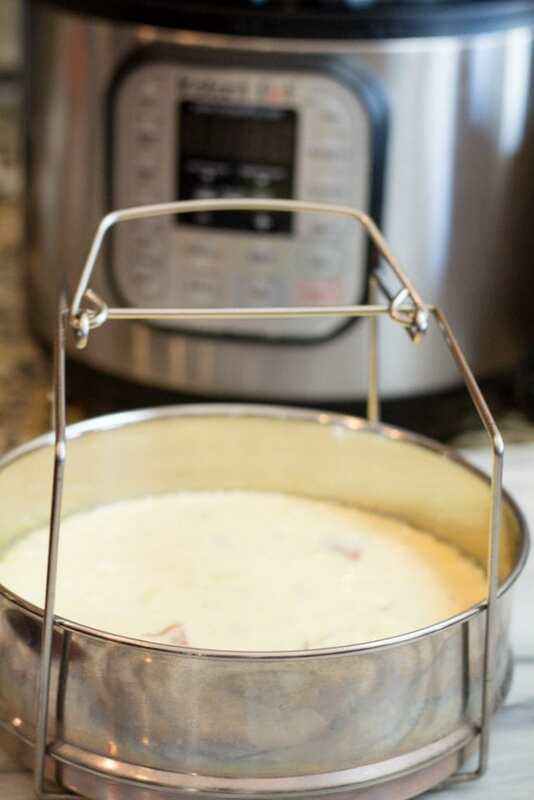 Place Egg mixture into a well greased casserole dish (needs to be an approved dish for the IP) or a well greased stackable pan and place in Instant Pot or Pressure Cooker on a trivet with 1 cup of water in the Pot. Set Pressure Cooker to Manual for 25 minutes and Quick Release the pressure. Remove from pot. 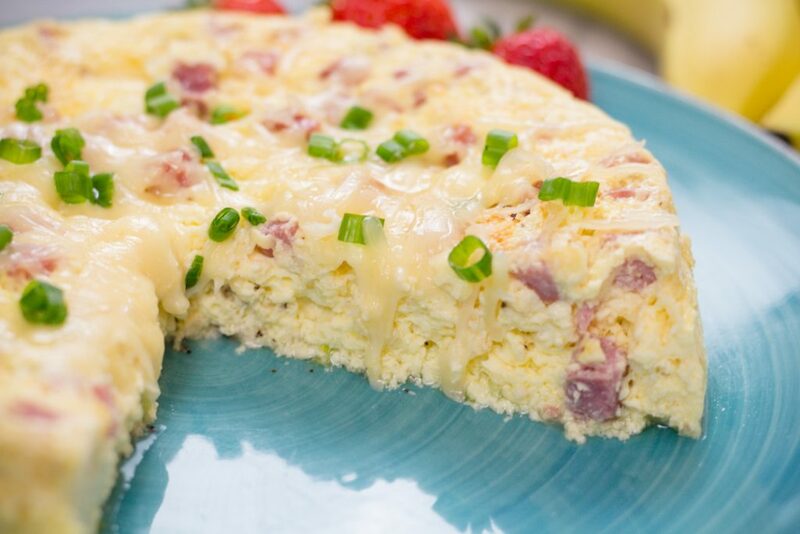 Ham and Swiss Cheese Crustless Quiche Instant Pot Recipe is an easy Egg Bake to serve for Breakfast or for any meal. 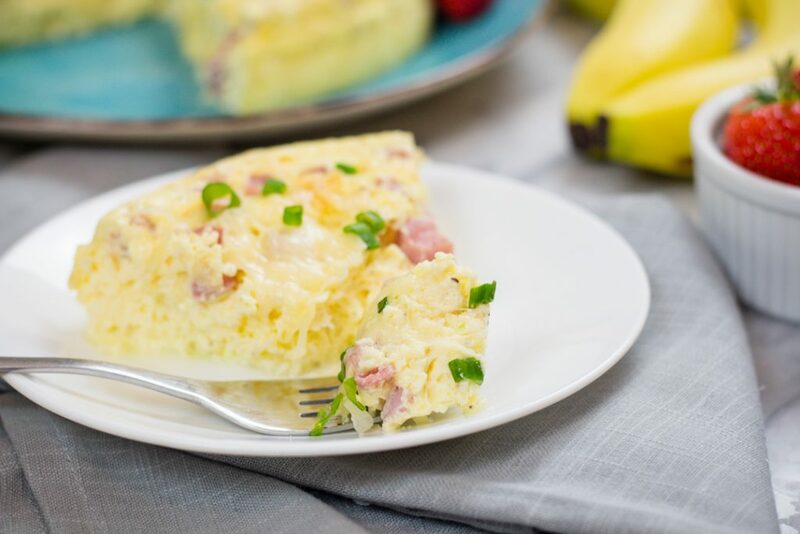 With cubed ham, green onions and shredded cheese, this Egg Bake Recipe is a favorite. In a medium bowl combine eggs and whisk. Add Ham, Green Onions, Cheese, Sour Cream and Salt and Pepper. Mix to combine. Add Milk and Heavy Cream. Mix to combine. In an approved bowl, pan, or dish pour Egg Mixture into a well greased pan. Run a knife around the edge of pan to release it and flip onto a serving plate. Garnish with additional Swiss Cheese and Chives. Add Extra Time: If you are using a glass or ceramic dish, you will need to add more time to this recipe. Adjust up to 5 minutes. Extra Liquid: Be careful when opening lid to not get any additional liquid on quiche. Extra liquid can be removed by taking a paper towel and blotting the areas to absorb excess liquid. Pan* I've used the Stackable Insert pan for Instant Pot and only used 1 of the pans for this recipe. 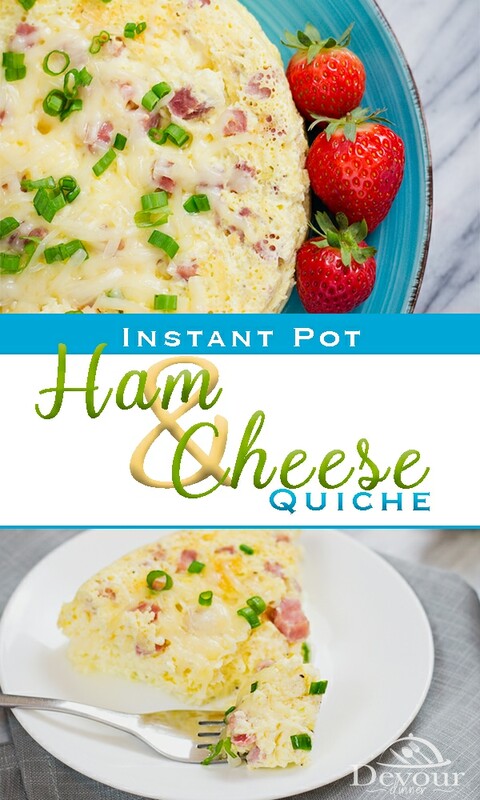 *Recipe made in a 6qt Instant Pot. Follow directions 1 and 2. 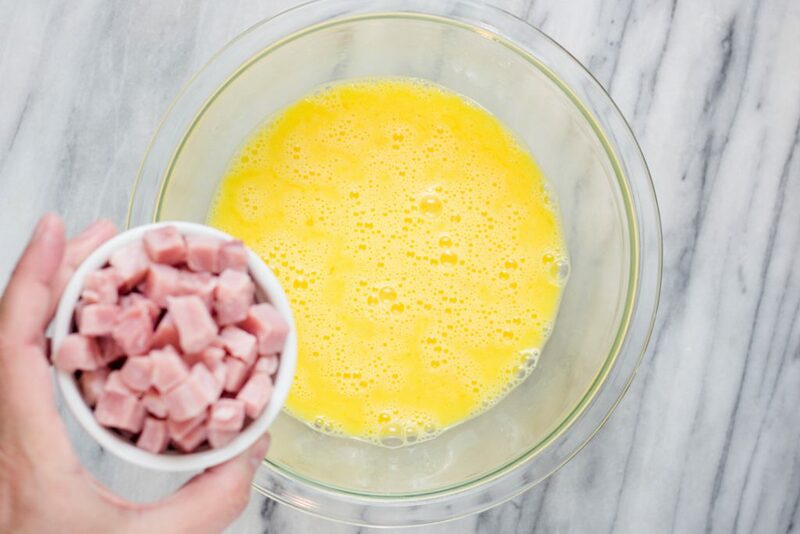 Grease a glass bowl or casserole dish and pour egg mixture into dish. Bake at 350 degree oven for 25-30 minutes or until a knife inserted near center comes out clean. Follow steps 7 & 8. Do you think Greek yogurt could replace the sour cream? 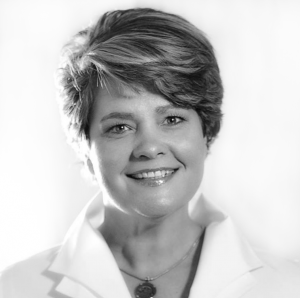 Hi Sandi! I have not tested Greek Yogurt as a substitute, however I think you can give it a try! Let me know how it works! Thank you for sharing! I am so going to make this… However I would like to make it with Feta & Butternut… Do you think I need to pre cook the butternut, or can I just cut it into small blocks and it will cook through?? Hi Claudia! This is a great question. I haven’t tested this personally but I would think you could definitely substitute both of those. My guess is the Butternut would cook just time in this time frame. It may be way over cooked. So you might experiment with the size you cut it up. Just a thought! I need to double this recipe. 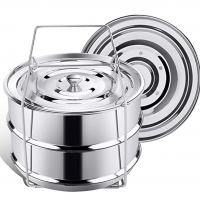 Can I use both stackable pans? I’ve never tried to use both the pans when making this recipe. Keep in mind the quiche cooks uncovered. If you use the pans, where the bottom will be covered, it might take a little longer for the bottom one to cook. But other than adjusting time, yes it would work. Is there anything wrong with me pouring the egg mixture right into the pressure cooker and avoid using that extra pan, water, and trivet? I’m a single guy who likes to keep it simple while trying to impress. And because I don’t have that extra pan you used. Great Question Dustin! There is a problem with just pouring it all into the pot without a pan. It likely won’t pressure up correctly and will burn the bottom. However, if you don’t have the 2 tier pan that I have used, you can also use a springform pan wrapped in foil and placed on a trivet so it’s out of the water you place below. You can also use a casserole dish that is approved for pressure cooking but you will need to add a few extra minute to the cook time. AND if you don’t have either of those, you can pour the quiche mixture into silicone egg molds and cook this recipe individually. The time will decrease in the smaller egg mold cups. This recipe looks good, however what if I want to leave out the ham and add a vegetable. Will the recipe still cook the same? This recipe is so versatile and you can substitute and change it up pretty easily. Go ahead and take out the ham and replace it with the veggie of your choice and you should be good!